In little more than a year's time and after appearing in only three feature films, James Byron Dean became one of the most admired screen stars of all time, achieving cult status and becoming an icon of American culture. The son of a dental technician, Dean was born in Marion, IN, an unprepossessing Midwestern burg that has since become a shrine to Dean aficionados. At five, Dean moved to Los Angeles with his family. Four years later, his mother died, and he was returned to the Midwest, to be cared for by relatives on their Fairmount, IN, farm. Upon graduation from high school, he returned to California and attended Santa Monica Junior College and U.C.L.A., later gravitating to acting, first with James Whitmore's workshop group, then in television commercials. His earliest existing film appearance was as one of Christ's apostles in "Hill Number One," a 1951 episode of the TV religious series Family Theatre. Working as a busboy between acting engagements in New York, he was given his first Broadway break in the short-lived The Jaguar. Dean soon began receiving uncredited bit parts in Hollywood films, the most prominent of which was his tongue-twisting turn as a soda emporium customer in Universal's Has Anybody Seen My Gal? (1952). Then it was back to New York, where he observed classes at the Actors' Studio. While making a few scattered live-TV appearances, Dean paid the bills by working as a "test pilot" on the audience-participation series Beat the Clock, walking through the various stunts in rehearsal to see if "normal" people could perform them during the telecast. Upon being cast in the Broadway play The Immoralist, he was compelled to give up his Beat the Clock job to another aspiring actor, Warren Oates. Creating a sensation as an Arab gigolo in The Immoralist, Dean came to the attention of director Elia Kazan, who'd previously brought the "Method" to the masses by casting Marlon Brando in A Streetcar Named Desire (1951) and Viva Zapata! (1952). 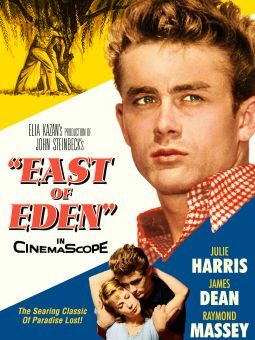 Sensing an embryonic Brando in Dean, Kazan cast the sensitive young actor as Cal Trask in the 1955 film adaptation of Steinbeck's East of Eden. Playing a hell-raising teenager who yearned openly and unashamedly to be loved and accepted by his rigid and taciturn father (Raymond Massey), Dean "spoke" to the disenfranchised youth of the Eisenhower era far more eloquently than any previous actor. Dean carried his loner persona over into his next film, Rebel Without a Cause (1955). Even after four decades, this Nicholas Ray-directed film remains the quintessential misunderstood-teen flick. While Rebel was in production, East of Eden hit the theaters, stirring up the first signs of Dean's staggering popularity -- what would later become the "James Dean Cult." Knowing they had a gold mine on their hands, Warner Bros. instantly upped the budget of Rebel, scrapping the black-and-white footage that had already been shot and starting the whole project over in color and Cinemascope. 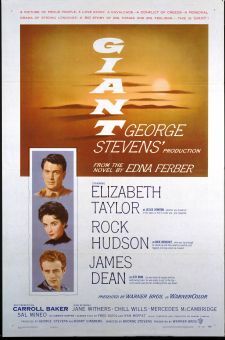 Now committed to a seven-year contract at Warners, Dean was afforded third billing to Rock Hudson and Elizabeth Taylor in Giant, director George Stevens' epic cinemazation of Edna Ferber's best-seller. As Jett Rink, Dean once more played the brooding outsider, this time separated from his heart's desire by his lowly station in life. Even when cast in a villainous light, however, Dean remains the most fascinating presence in the film, especially in his brilliantly choreographed climactic drunk scene. Dean plays the cast-off loner in all three of his starring features, unable to draw attention to himself until forcing the issue. Off camera, Dean unfortunately possessed a fascination with fast cars. Upon completing Giant, he piled into his new 7,000 dollar Porsche and zoomed off to a racing event in Salinas. Traveling 115 miles an hour, Dean was killed in a head-on crash just outside Paso Robles, CA. The hysterical outpouring of grief that attended his death had not been witnessed by the motion picture community since the demise of Rudolph Valentino in 1926. The cult worship of James Dean assumed a variety of shapes, sizes, and degrees. 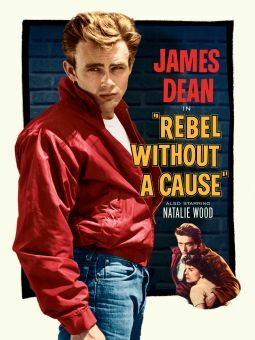 Book upon book has been written about Dean's short life; original poster art from his films has been auctioned off at astronomical prices and two full-length biopics have been produced: the hastily cobbled together The James Dean Story (1957) and the made-for-TV James Dean (1976), the latter project based on the memoirs of Dean's roommate, James Bast, and starring Stephen McHattie. After Dean's death, two of the actor's scheduled post-Giant projects, the 1955 TV musical adaptation of Our Town and the 1956 Rocky Graziano biopic Somebody Up There Likes Me, were both re-cast with Paul Newman. It is quite possible that the James Dean mystique, which persists to the present day, might not have been as intense had he lived longer, but like so many others untimely ripped from our midst -- Jean Harlow, Marilyn Monroe, John Lennon -- James Dean has transcended mere idol status and entered the hallowed halls of Legend. First professional acting job was a commercial for Pepsi. Worked as a stunt tester for TV's Beat the Clock. Drove competitively in professional car races; placed in the Top 3 in the first two events. Received his only two Academy Award nominations after he died; the initial one (for 1955's East of Eden) was the first posthumous acting nomination in Oscar history. Honored on a U.S. postage stamp in 1996. In 2002, the intersection where he was killed in a car accident was officially renamed the James Dean Memorial Junction.